How do you deliver efficiency, control costs and support business Growth, while anticipating and reacting to new data dissemination services? ZagTrader Custody Management System is an integrated portfolio accounting investment management system covering (order management), trade execution, clearing, settlement and safekeeping functions. The ZagTrader Feed Aggregator system was designed to focus on how to solve the struggles that most exchanges face when upgrading their existing platform. One common issue these exchanges face is the re-certification process with the system upgrade, and the third-party platforms that are connected to the current system. ZagTrader Feed Aggregator helps firms meet all their needs by providing their end user a fast, reliable and global solution whilst maintaining their independence and adapt to industry changes with a scalable software and infrastructure. Connect with Multiple Data Sources and Redistribute them through ONE Channel. Normalize data in a unified standard data structure. Upgrade your existing system easily with no hassle. Avoid the re-certification processes with any third-party platforms. Supports UDP and TCP connections. Ready-made SDK is available to be provided to consumers – which will speed up the development. Capable of changing the data on the fly before it is sent to consumers. 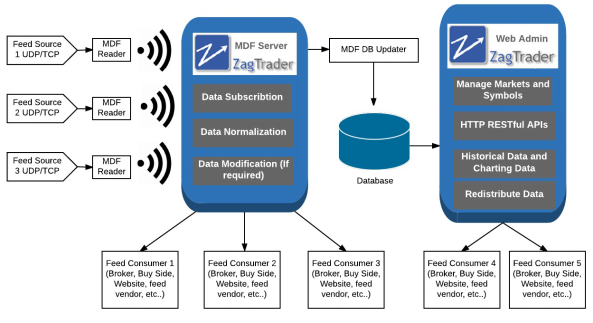 ZagTrader MDF Readers aggregate the Level 2 order book(s) of exchanges into a real-time live data structure. Multi market, multi asset class and multi-currency system. Feed consumers can subscribe to a certain set of symbols within a market, or a combination of markets. Empower the database with snapshots of the data feed to be used for other applications. Historical data retention and aggregation. Advanced web administration to manage the markets, symbols and corporate actions. Web based APIs that supports running http RESTful APIs. Relational Database storage – CREATE Custom procedures and enhance the experience further. Multi market, multi asset class and multi-currency system, publish your own API’s, maintain your independence by having the freedom to upgrade and update and increase your footprint of the exchange or financial institution. Avoid recertification with any 3rd party platforms and upgrade your existing system without any hassle, making it easy and fast to deploy and eliminating the cost and maintenance burdens of a traditional implementation. The ZagTrader Feed Aggregator will act as a real-time re-transmission layer that will connect with different Feed sources and protocols from one end, normalize the data in a standard data structure and send it to the feed consumers such as Execution Management Systems, Order Management Systems, other Service Providers, etc. from the other end. This will maintain a standard data feed format for the consumers, and will allow any transparent upgrades to the exiting environment.